Should you buy a domain name if it’s not available on social media? 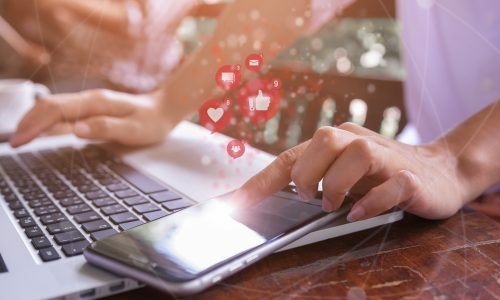 Social media has become an integral part of business communications, whether it’s used for marketing, PR, customer service or simply brand protection. If it’s for the latter, most business owners will want to have a domain name that matches their social media handles. A memorable social media handle is crucial for your online identity. A handle is the username of your social media account, making up part of the URL for your page. It is also the name customers can use to tag your business in posts. Not only do social media handles make it easier for customers to find your company, they also simplify how users can find you, especially when printed on marketing material. Coming up with a great name is one of the first creative steps people make when developing a new business. It’s something that can inspire you, that can reflect what you want your business to stand for, as well as the personality you want it to embody. But what if it’s not available everywhere you want to register it? Should you avoid registering a domain simply because the equivalent isn’t available on the social networks that you want to promote your business on? Let’s take a look at why domain names and handles are important, and what you can do if you face this conundrum. Why is your domain name important? Your domain name has an impact on your SEO . That said, we’ve moved away from exclusively using keywords as domain names as they can appear to limit your product or service offerings and Google can view them as spam (particularly when you mention your domain name in your website copy). Now, best practice tells us your brand should be reflected in your domain name. As an added benefit, when you use your business name as your domain name, you can take advantage of navigational search. This is when a customer has heard of your business – either through word of mouth or marketing material they have come across – and they type your business name directly into Google. If you don’t use your business name as your domain name, you miss out on a hefty chunk of organic searches in favour of a keyword-stuffed domain that may not have much of an effect on your rankings. As your social media profiles are an extension of your brand and a tool used to drive customer loyalty and sales, it’s only right to give them as much consideration as you do your domain name. Good social media handles can increase your brand’s professionalism and make it simpler for you to let your customers know where you are. But there are other important factors to consider as well. Social search is on the rise and, just as they are on Google, customers are performing navigational searches through social media platforms. If your handles don’t appropriately reflect your business, you can miss out on being found through Facebook, Twitter, LinkedIn and other platforms. What can do you about it? It’s not all doom and gloom. You don’t have to necessarily give up your perfect domain name just because the same name is not available on social media. Instead, you can try these alternatives. If your business name is Oracle (for example) but it’s already taken, simply make your handle @OracleAU, @OracleAUS or @OracleOz. All three of these will represent that you’re an Australian business, which will help with brand recognition. Not a local business? Try adding a base, such as @OracleHQ, which can add a level of gravitas to your page’s handle. If your business name is Oracle and you sell arts and crafts, make that clear by choosing a handle such as @OracleCrafts, @OracleArts. You can get creative with your handle while still using your brand name. For example, you could use @WeAreOracle, @ThisIsOracle or even @HelloOracle for a more approachable way for customers to find you. Depending on what’s relevant to your business, you can use action words to preface your business name, like @GetOracle, @VisitOracle. The key is not just to look professional, you also want to look original. It’s important to note that you shouldn’t add numbers to the end as they will only make it seem like you’re late to the party. It’s also not recommended to use dashes, underscores or full stops as they’re easy to forget or mistype and each social platform has different rules on whether they’re recognised or not. Ultimately, whatever you decide it’s important that your handle is consistent across all platforms – or as close as possible. You don’t want to lose followers or engagement just because users can’t remember the difference between different social media handles. Still worried about your brand? If you’re still concerned that your social handles don’t match your domain name, remember that you’re not alone. Brands in Australia and around the globe have had to make similar tweaks to their handles. Take Australian telecommunications company, Belong, as an example. On social media, they are known as @LetsBelong. One thing they haven’t done, though, which could be beneficial to protecting their brand’s authority, is register the domain letsbelong.com.au. If you’re concerned about someone imitating your brand, the best solution is to register multiple domains. Make oracle.com.au your primary domain, but also register and redirect oraclearts.com.au or weareoracle.com.au, depending on what you choose. If you’re still unsure on the best course of action to kickstart your online brand, why not get in touch with one of our online solutions advisors? We’d be more than happy to help develop the right strategy for your business.